Nearly 20 million visitors have passed through the doors of the San Diego Convention Center since it opened 25 years ago this month. The center has emerged as the cornerstone of San Diego’s third largest industry, hospitality, and has generated more than $24 billion in regional economic impact by hosting more than 5,000 events. Equally important, the center has generated $450 million in tax revenues for the City of San Diego, helping to pay for basic city services, including police and fire protection, street, park and beach maintenance, as well as libraries and museums — reducing the tax burden on the local taxpayers. In recognition of our years of success, Mayor Kevin Faulconer has proclaimed November 24, 2014 “San Diego Convention Center Day,” recognizing the facility as the region’s premier gathering place for a quarter-century. San Diego’s convention center leads the industry in environmental and social responsibility by operating in an ecologically sound manner with a commitment to the support and encouragement of sustainable practices. In 2011, after multiple environmental upgrades, the center achieved LEED Silver Certification from the U.S. Green Building Council — demonstrating you don’t have to be a new building to be certified as an environmental leader, just committed to making the earth a better place for future generations. A proud community partner, the convention center gives back to community charities and schools, generously donating over 565 tons of food, clothing and other items over the years. To celebrate its own 25th anniversary, the convention center held a community luncheon, raising $50,000 for the Downtown San Diego Partnership’s “Make Change Count” program which provides assistance to the homeless population in downtown San Diego. Employees of the San Diego Convention Center, many of whom have been with the building since the first year, have provided clients and guests with outstanding service, consistently exceeding expectations in a manner that secures future business and economic benefits for the entire destination. In fact, approximately 70 percent of the center’s business is repeat business due to the high level of service our clients receive. The convention center is proud to partner with seven local labor unions and support more than 12,500 jobs for San Diegans throughout the region. The success of the San Diego Convention Center would not be possible without the continued support of the City of San Diego, the Unified Port of San Diego, the hotel and hospitality industry and the meeting planners who choose San Diego as the backdrop of their meetings year after year. We have become the envy of the industry, winning awards and leading the way. This facility has helped put San Diego on the global map as a model for how to do a convention city right. We must continue to find a way to build on our success with a Phase III expansion of this facility. In this competitive environment, standing still is losing ground. We need the 6,800 new jobs an expanded center would create, the tax revenues it would generate and the infrastructure necessary for us to remain the world-class meeting and convention destination we are. When the doors of the center opened in November of 1989, a regional economic catalyst was born. Today, 25 years later, the facility continues to be prosperous for the entire region. It’s a record of success we can and should build on. As we eagerly look forward to the next 25 years, please join us in taking a moment to look back and celebrate everything we have accomplished this November 24th, “San Diego Convention Center Day” by sharing your favorite convention center memory with us on our Facebook page or via Twitter with the hashtag #SDCCat25. 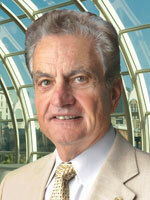 Written by Nico Ferraro, Board Chair for San Diego Convention Center Corporation. For more information, contact Jon Lynch, Communications Specialist at 619.525.5277, email Jon.Lynch@visitsandiego.com or visit www.visitsandiego.com.